Daily actions of Customer Service are what makes a difference in the minds of the people we work with. Both internally and externally, we serve to fulfill a need or obligation. Now, be honest… how often is the way we work with people simply a combination of “habit activities” we’ve designed in order to get us through the workday? As the graphic points out… many of the functions and actions we perform every day are “thoughtless” processes or habits that we’ve developed to get us from Point A to Point B. This is neither good nor bad, it just is. But I’d like to make this into an opportunity to be systematically good. My challenge to you is this… BE INTENTIONAL! 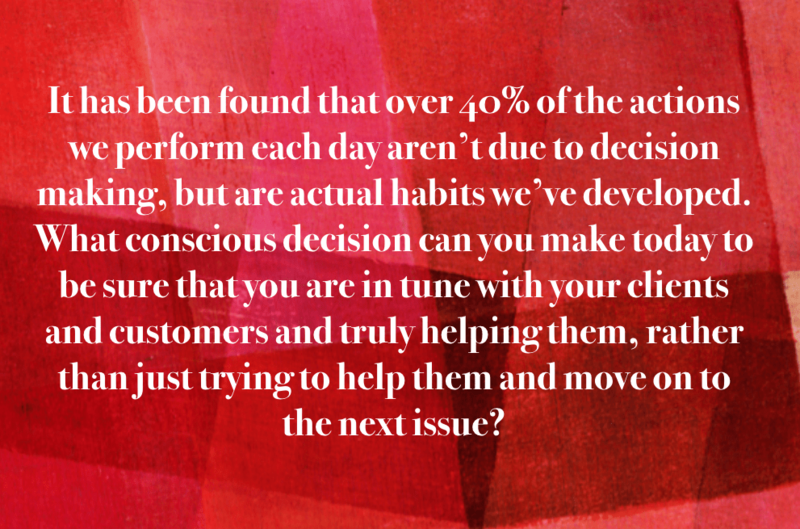 Develop habits and processes into your daily conversations and routines with customers that show them you are focused on them, focused on serving them, focused on acting in their best interest, and focused on partnering with them. Deliberately decide on a few actions you’d like to turn into “mindless habits” that show your desire to be intentional and focused on others. Example… If you drive through a coffee shop daily on your way to work, make Tuesday’s your “Pay It Forward” day and buy a coffee for the person behind you. When you make copies on the copier at work, always fill the paper tray to the top when you are done. etc. The more intentional your actions are, the more impactful they’ll be. By intentionally doing the right thing, making a positive change, putting a smile on someone’s face and becoming so routine in these that they become habits, the better it is for everyone. I know it sounds a little “Rosy Colored Glasses,” but really, who wants to look at the world through muddy glasses?